Pear & Almond Cream Tart - Let the Baking Begin! I don’t know if this picture actually relays how delicious this tart actually was. I think this is one of those things that tastes a whole lot better then it looks. I brought this tart to a girls get-together and served it already cut up into the slices. At first nobody really paid much attention to it until somebody said that I brought this tart (at which point, some of the people passed the “reaally?” look around, this is how unattractive this tart was sliced up) and so people started each taking a piece. Let me just say, that people were very surprised to find out how delicious this tart was was, contrary to it’s looks. Some said that this tart is the best tart they’ve ever had. Others said that now they know what a real frangipane tart should taste like and realize how bad the last frangipane tart from a French pastry shop was. To be honest, I really didn’t have any expectations for this tart, other than I anted it to have the flaky crust and include pears that I poached in some vanilla and liquor infused syrup. I did want to find out what the frangipane filling tasted like too, I mean it sounds so French that you know it has to be good. So if you have some pears laying around and wonder what you should do with them, here’s one option. And a good one, if I may say so myself. Walnut Stuffed Prunes – Simple prunes recipe. 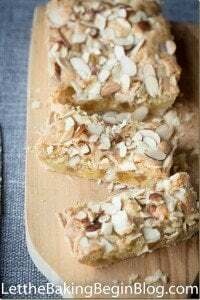 Pistachio-Walnut Baklava Rolls – Delicious dessert rolls. Souffle Tarts – Shortbread tarts filled with plum butter. Combine all the dry ingredients (flour, powdered sugar, salt) in a large bowl. Slice the cold butter into to the flour. Keep cutting until the chunks are about the size of a pea (or add everything to the blender and pulse until the chunks are pea-size). Add the egg and mix the ingredients together with a spoon. If using the blender, add the egg and process until the dough starts to stick together. Use your hands to kneed the dough until it barely starts to come together. Push the dough into a ball (it will be very crumbly, but that’s ok). Cover with plastic wrap. Flatten to make a disk. Refrigerate for about 1 hour. (Prepare the pears during this time). Remove the dough from the refrigerator. Shape it into a ball and roll it out between 2 layers of parchment paper or saran wrap, to about 3-4 mm thick (you could just flour your work surface really well and not use the parchment). Transfer into the 12 inch tart mold and pat it with your fingertips to fit it tightly inside the mold. Prick the dough with a fork. Refrigerate for 30 minutes or freeze for 15 minutes. Preheat the oven to 300F and bake the tart for about 15-20 minutes. In a large pot combine, sugar, water, lemon juice, vanilla extract, star anise, alcohol and the cinnamon quill. Bring to a boil. Place the peels & cored pears into the syrup and simmer for about 30 minutes. Let cool (I left the pears in the syrup overnight, which allowed the pears to be completely infused with vanilla). Once cool, remove pears from the syrup and and slice them thinly. You can use either blanched or unblanched almond (with the dark part of the nut on or off). Put the almonds and the flour into the bowl of a food processor and grind. 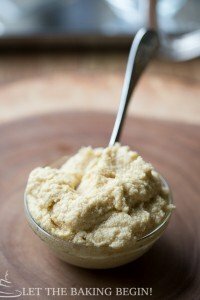 In a bowl of an electric mixer beat the softened/room temperature butter and sugar. Add eggs one at a time and mix well between each addition. Add the ground up almond mixture. Mix until well combined. Spoon the frangipane mixture into the tart and spread it around. 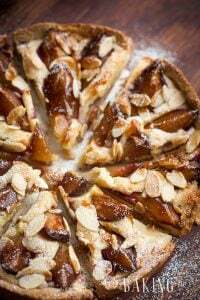 Place the thinly sliced pears on top of the frangipane, making a circle, leaving about an inch space from the tarts edge. 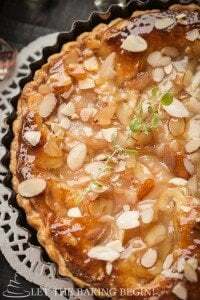 Sprinkle sliced almonds around the edge of the tart. Bake for additional 45 minutes, at 300F. While the tart is baking, reduce the leftover syrup/poaching liquid, until thickened (almost like honey). Brush the tart with this syrup as soon as it comes out of the oven. 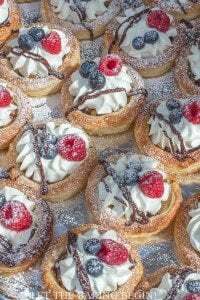 *Instead of making the glaze, you can brush the tart with honey, heated jam, or alternatively sprinkle with powdered sugar. I made this tart today and I’m wondering if you’ve made an error on the oven temperature. 300 degrees F seems very low. It just doesn’t set in the time recommended. That is the right and temperature and time, but every oven is different and you might need to bake it for a couple minutes longer for the Frangipane filling to be baked through. The filling is sort of creamy though, so even when it bakes through, it does not harden in the time it bakes. Thanks for the quick reply! Alas, I couldn’t get this tart to set at 300 degrees F, even with 15 minutes extra time in a well-calibrated oven. Not even close. In the end, I increased the temperature to 375, which is in the range of what other recipes recommend for frangipane (e.g., Epicurious, Bon Apetit, King Arthur Flour). The other recipe you pointed to in your reply calls for 350 degrees. It’s a delicious tart and one I’ll make again, but as an experienced baker I really do recommend increasing the temperature. So, I am allergic to tree nuts but this sounds amazing. Because I don’t cook with nuts I don’t know what would be of similar consistency as ground almonds. Any suggestions for a substitution?